Over the last eight months, Tara Whitsitt has been driving a bus teeming with bacteria, yeast and fermented food across the country. On Friday, she arrives in Philadelphia, her latest stop on a cross country tour aimed at educating people about the wonders of kimchi, kombucha, sourdough, vegetable pickling, and all things fermentation, while showing how fun and easy it is to begin the practices at home. The benefits of eating fermented food have have been linked to positive health effects, improved digestion and mental health and even weight loss, and have been attracting the attention of scientists while prominent food writers such as Michael Pollan and Sandor Katz have championed the political ramifications of taking greater control of food production. For Whitsitt, the political began with the personal. She quit eating meat—not easy for anyone in her meat-loving hometown in East Texas—at the age of seven. Her dietary struggles led her to begin cooking by the time she was 10. But it wasn’t until 9 years later, as a student abroad in Denmark, that she discovered the European diet, consisting of pickled vegetables, sourdough bread and fish, was making her feel great. Immediately after college, Whitsitt moved to Philadelphia—“I loved the history, I loved the people, I loved the big city small town feel, I loved the cobblestone streets.”—where she worked as the the inventory manager for video company TLA Releasing. Two years later, she moved to Brooklyn to be closer to family, and there she did some work as a logistics manager for Common Goods and then M Z Wallace. Meanwhile, her interest in fermentation was growing like bacteria in a cheese room. Ready to devote herself to her passion for food and eager to find a place to do it, she boarded a plane for Eugene, Oregon. Once there, she visited the intentional community at Alpha Farm, a 280-acre farm in Deadwood, Oregon that since 1972, has been home to a rotating cast of approximately 20 people seeking refuge from the modern world. She regularly cooked for the community and fermented food and wine in earnest. After staying there for a year, she spent some time on nearby orchards, bouncing from farm to farm, bartering with fermented goods and labor. It was a relief from the money-centered world of New York City she left behind. 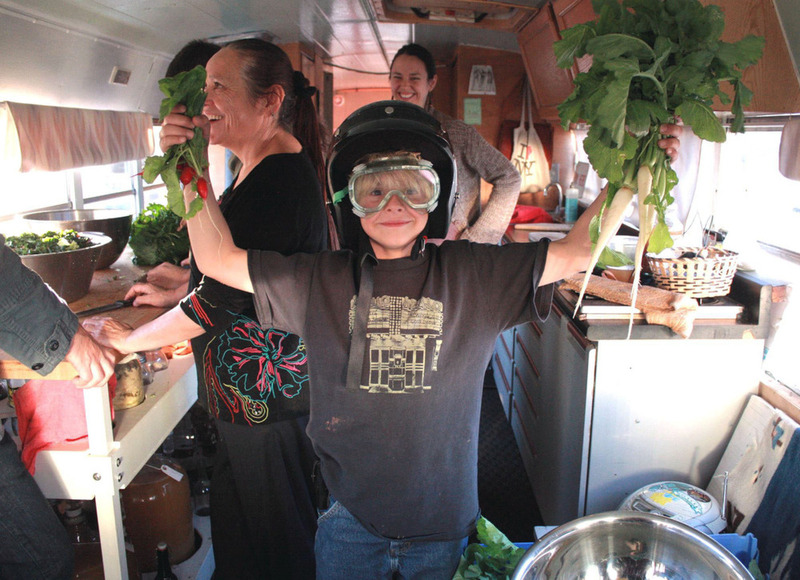 After outfitting her bus with a workshop space and fermentation lab with cabinets and shelving to transport her cultures and act as an educational space, and began her tour as the Johnny Applesseed (Janie Sauerkraut?) of the fermentation world. Fermentation on Wheels, in partnership with Philly Homebrew Outlet, is organizing a benefit from 3 to 10 p.m. Saturday, May 24 at 1447 N American St. The event will include talks by passionate people in food justice, a vegetable fermentation workshop, a starter culture swap, food awareness literature, food and drinks potluck-style, and more. 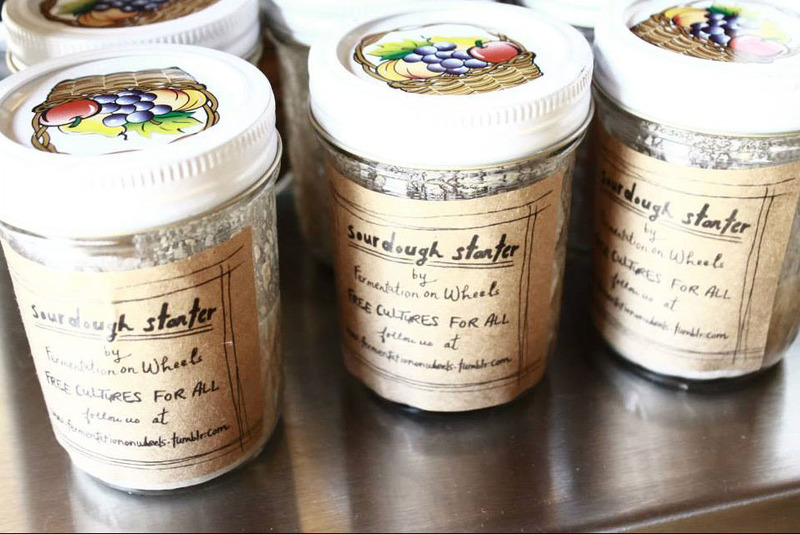 This benefit will lend support so Fermentation on Wheels can continue teaching low-income children and adults for free, as well as inspire people to live more sustainably and ferment in their own kitchens. Events include a Vegetable Fermentation Workshop by Tara (produce donation by Mariposa Food Coop) and a Starter Culture Swap on the bus with a potluck dinner. To donate, please register on Eventbrite.